PEOPLE 245 – GOING TO WORK 13 – AND HAPPY CHRISTMAS!!! First things first >>> a very HAPPY CHRISTMAS to you all!!! And many of them too!!! 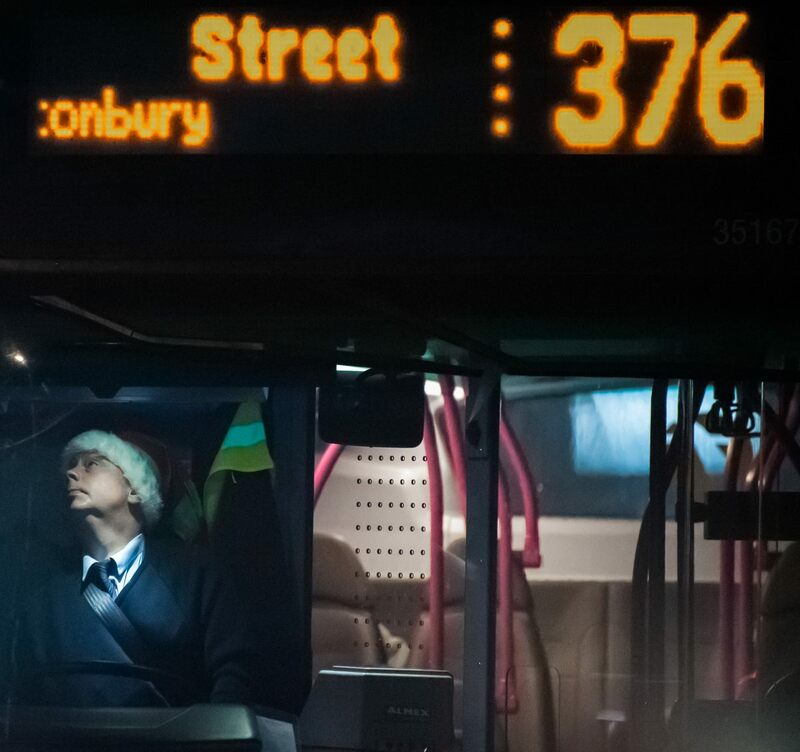 And so to a bus driver, before sunrise, wearing a Santa hat as he prepares to pull out into the traffic near Temple Meads, Bristol’s main railway station – a grab shot made possible by the D700’s instant and unerring autofocus. Things to see? Well, the 376 is on its way south to the Somerset town of Street, which is so named because there is a Roman road nearby. It will also call at nearby Glastonbury – the second half of that iconic destination’s name can also be seen up there on the front of the vehicle. The driver has his cab light on, and is looking up checking something in his cab. As well as his Santa hat, he is wearing his seatbelt, and he has hung his yellow, high visibility jacket up behind him. Then, faintly seen, there is the curved, black top of the vehicle’s steering wheel, just catching the light. And to the right the ALMEX machine that reads travel cards and prints tickets. To the right is the transparent (but reinforced) plastic screen with many holes – which allows the driver to communicate with his passengers, while being kept safely away from those who might feel constrained to become “over-familiar”. And further back are some of the vehicle’s seats, and the stout pink bars for hanging onto while the vehicle navigates Somerset’s twisting roads and lanes. Earlier images I this series can be found here, here, here, here, here, here, here, here, here, here, here and here. D700 with 70-300 Nikkor lens at 300mm; 25,600 ISO; 23 Dec 2016. 13 Responses to PEOPLE 245 – GOING TO WORK 13 – AND HAPPY CHRISTMAS!!! I’m going to have to go and have a little sit down now … 😀 …. Hope you’re enjoying the Seasonal Festivities, Adrian. Love the image. Makes me think about all the people having to work throughout the holiday. That’s quite a tranche de vie. I was aware of the Roman origin behind the name Bath but confess I’d never even heard of the town of Street. A happy Christmas and New Year to you. Glad it gets to you!